David Gamm, MD, PhD, and University of Wisconsin colleagues report the first induced pluripotent stem (iPS) cell model of Best disease, a rare, genetic disorder that leads to macular degeneration. 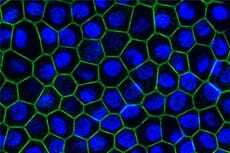 The researchers derived iPS cell lines from skin samples of Best disease patients and their well relatives, which were then reprogrammed into retinal pigment epithelial cells. This study published in Human Molecular Genetics underscores the utility of this "disease in a dish" model to understand the mechanisms of macular degeneration.